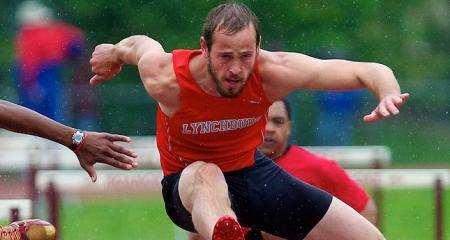 James Bell took third in the NCAA Division III decathlon Saturday, earning his second career All-American honor. He came from 17th place in day one of the two-day completion with an incredible outing to finish third. He started off the second day earning 770 points in the 110 meter hurdles with a time of 15.67. The next few events were the strongest for Bell. In the first throwing event in the afternoon, Bell launched the discus 113’6″. The toss earned him 556 points after being the fourth best throw. In the next event, his best, Bell won the pole vault competition, tying a career best of 15’9″ and earning 849 points. Competing in another of his stronger events, the javelin, Bell finished third and gained 632 points. The heave of 173’7″ was the longest of his career. He ended the night in the 1500 meter run, coming in at 4:44.31. The ninth place finish gave him 653 points for the event. Along with the other personal bests, Bell finished his career with a lifetime best in the decathlon, earning a total of 6,742 points. With the conclusion of the event, Bell leaves Lynchburg as a two-time All-American and a nine-time ODAC individual champion.